Vanilla is the second costliest spice in the world, after saffron. Those vanilla beans are expensive; but they provide superior flavor over vanilla extract (and we mean real vanilla extract—don’t try to save money by using artificial vanilla). Vanilla beans need to be stored in an airtight container. That’s why some beans are sold in their own glass capsule. Keep them in a cool, dark place—but never in the fridge, where they will harden. 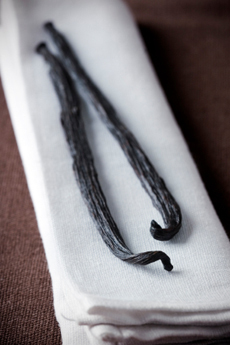 Properly cared for, vanilla beans should last for two years or more. If your bean becomes dried out, don’t worry: As soon as it’s added to the warm milk or cream in the recipe, it will plump up. It’s easy to use vanilla beans. Some recipes call for the whole bean (the pod, shown in the photo). Some require only the seeds inside the bean. If you need only the seeds, split the bean lengthwise and scrape them out. Don’t throw away the pod: It can be used in another recipe. Even if a pod has been cooked, you can dry it for 3-4 days and toss it into a canister of sugar, tea or coffee, where its flavor will infuse. More care notes: Tiny crystals covering a bean indicate a top-quality bean, not an inferior one. On the other hand, a fuzzy coating indicates mold, which has affected the flavor of the bean. Throw it out. Mold occurs where there is dampness and the bean isn’t in an airtight container.